After five looong weeks since last issue, we finally saw the release of Daredevil #18 today. The issue is the first of a new four-issue arc, and an excellent jumping on point for new readers. This week, we learn that Matt Murdock has the circulatory system of a Ken doll (I would have loved to see the reactions of groups like the “One Million Moms” if Paolo Rivera had dared to go the anatomically correct route on the cover…), that Foggy is still really mad, that Matt has more women in his life than he can handle – whether real or imagined – and that that Waid, Samnee and Rodríguez still have it. In spades. Daredevil #18 is a fantastically entertaining issue that introduces all kinds of new interesting twists. However, since Daredevil #18 covers so much ground, it’s difficult to review without spoiling certain key moments. That’s my way of telling you to proceed cautiously if you haven’t read this issue yet. After Matt and Foggy parted ways in Daredevil #16, one might be forgiven for assuming that Foggy would play a marginal role in upcoming issues. That’s not the case at all here. 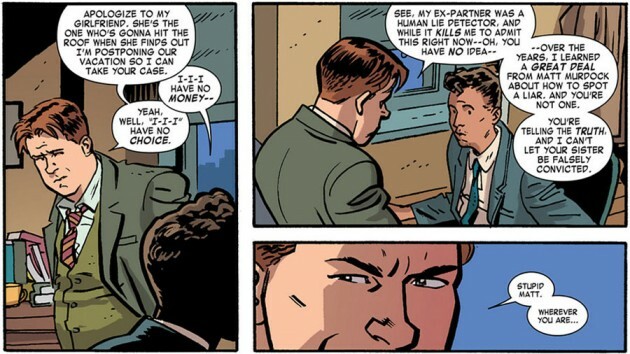 In fact, the issue begins with a long scene in Foggy’s office that sees him reluctantly agree to help a new client whose dilemma falls squarely within the Daredevil domain, and sets part of the stage for this arc’s mystery villain (who remains just that thus far, although his presence is clearly felt). The way Waid uses Foggy to give everyone the necessary background going forward is very clever writing. We get to stay in touch with a core cast member despite his and Matt’s “legal separation” and the way the story unfolds creates a plausible scenario for how Daredevil becomes involved. The next scene reveals that Matt and Kirsten have apparently kept in touch and are looking mighty cozy while approaching Matt’s apartment. Kirsten appears more than willing to take their relationship to the next level when Matt recognizes a familiar heartbeat and has to cut their date short. Kirsten is left wondering what could have caused Matt’s very sudden change of heart while the reader is left wondering just who might be hiding in his apartment. The truth is shocking. Waiting for him in bed, as if none of the tragedy that robbed her of her sanity had ever happened, we find Matt’s former wife Milla. Here, Waid quickly and efficiently tells new readers all they need to know in order to grasp the urgency of the situation and Matt’s apparent desperation. This is when Matt decides to reach out to Foggy, who reluctantly agrees to help him get to the bottom of Milla’s escape from the psych ward. Handling the situation temporarily, Matt then sets out – as Daredevil – to chase down the mobsters threatening the sister of Foggy’s new client. What follows is a standard superhero fight scene, which is not all that interesting in itself, although it’s well choreographed and illustrated. The interesting part is how it ends, when physical reality starts to appear more malleable than usual. Up until this point, one might have been wondering whether Matt was simply hallucinating Milla’s sudden appearance, but a mysteriously disappearing villain suggests that there might be something bigger going on, happening outside Matt’s mind. When Foggy reports back from his visit to Milla’s hospital, we get a final scene that will have Matt and fans alike scratching their heads, at least for the next four weeks until Daredevil #19 hits the stands. I really liked this issue. The pacing was perfect, the twists and surprises were intriguing and I loved seeing Waid address the long ignored situation with Milla. Chris Samnee’s art was the best I’ve seen so far since he came onboard, and that’s saying something. Aside from the energy and charm Samnee always brings to the table, this issue is full of little details for the reader to enjoy. You see the Murdock name scraped off the door (and meticulously covered in ink in Foggy’s notebook), there’s Mike Murdock’s hat dumped in a waste basket, an absolutely wonderful framed picture from the firm’s early days, Milla’s cup of tea splashed all over Matt’s floor, and a perfectly rendered fisheye lense effect. The list could go on, and Javier Rodríguez’s vibrant colors makes the finished product even better. If there is one thing I would change about this issue, it’s Foggy’s too austere attitude in the face of even more evidence (from his perspective, at least) that Matt might be seriously ill. It’s one thing to realize you’re being lied to and quite another to discover that your best friend might have had a psychotic break of some kind. On the other hand, there might be a reason for this behavior that has yet to be revealed, and I’ll be looking forward to seeing where Mark Waid & Co. take us from here. Don’t forget: we also learned that his horns are alive. Anyway, I look forward to seeing your “co-creation” Coyote in upcoming issues, and please keep those covers coming, they’re amazing! I was a bit concerned to see Milla is being kept in a padded cell. That’s really not how the mentally ill are treated in modern hospitals. While we’re on the topic of Milla, I wrote a post about the character back in 2009. Link here. I was asking for Milla on my previous post , and they brought her back. Will Dakota North follow up soon? I hope so. I like the fact Waid is adressing issues from Matt s past, and your review was very good. Be well. Concerning Foggy, I agree with you Christine, one would think that finding human remains in a drawer and now this ‘seeming’ delusion over a loved one would convince Foggy that Matt needs some serious help, not just anger and attitude. But maybe Foggy is suffering from the same condition as we dear readers, in that this appears to be yet another chapter in the never-ending cycle of Matt’s breakdowns and tragedies. Maybe Foggy has reached the point now after seeing so many breaks, that until Matt himself admits that he needs help, Foggy is through with the situation. 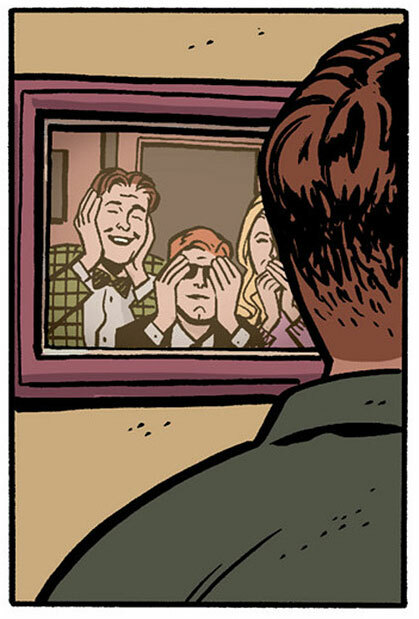 Either way, another terrific issue by Waid and Co. Bring on Coyote!